Following the announcement from earlier this month about an upcoming HODL hardfork, the coin has successfully hardforked at block 257000 and is now an interesting option for miners. 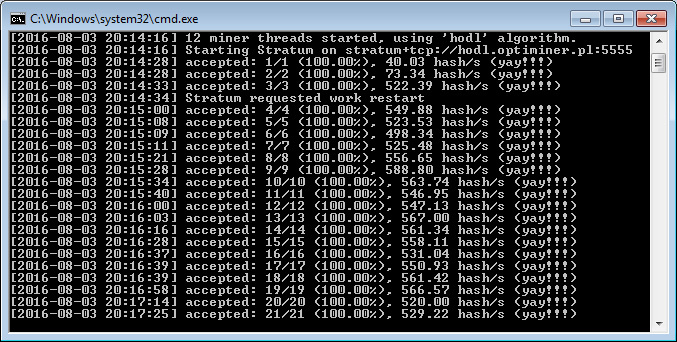 Do note however that HOdlcoin (HODL) can be mined only with a processor, so this coin is for CPU miners. Prior to this hardfork all mined coins were automatically locked in a deposit for 1 year and you had to wait for that period to finis in order to get access to them, but after the successful hardfork you can mine and not have the coins automatically deposited for a year anymore. All previously mined coins prior the hardfork will still be locked for 1 year deposit, before they become available for use, so only new coins that you can mine now will be available immediately! If you want to have a local HODL wallet make sure you have the latest one – HOdlcoin Core wallet version 3.0. There is only one HOdlcoin Mining Pool available for now, the fastest CPU miner for the coin is the Hodlminer Optimized Optiminer fork that you can use to mine on the pool. You can also use the built-in solo mining functionality of the wallet, but with the high network hashrate this might not be the best idea. HOdlcoin is currently being traded on Coinexchange, though if it manages to earn back enough interest from miners and users it might appear on other exchanges soon. Last year we were actively following the development of the HOdlcoin (HODL) project up until there was a hardfork that essentially killed our interest in the coin. The Hardfork to version 2.0 introduced the rule that all new mined coins will automatically be staked for 1 year and also made obsolete the need of mining pools. As a result not only we lost interest, but many users that deemed the project interesting also did and from there on things pretty much started moving on a downwards spiral. Fortunately recently there was a decision for a new hardfork in order to bring back the regular mining as it was before the weird decision from the previous hardfork. 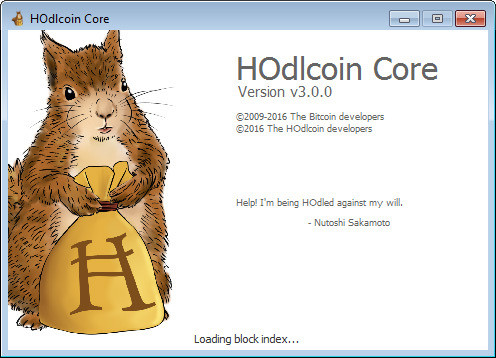 In order to get ready for the upcoming hardfork you need to upgrade to the latest HOdlcoin Core wallet version 3.0 before the network reaches a block height of 257000 when the hardfork will be activated. There is still some time left before the hardfork as the current block is 244607 and you can track how things progress via the official HODL blockchain explorer. The new wallet comes with some long awaited improvements such as tables sorting of the deposits, improved mining performance and some bugfixes. Up until recently HOdlcoin (HODL) was only traded on the Yobit Exchange, though after the announcement for the upcoming hardfork there is a new altcoin exchange on board as well – Coinexchange. There is still only one HOdlcoin Mining Pool available by Optiminer, though we might be seeing some more getting back on board after the hardfork. The latest best performing miner for HODL is the Hodlminer Optimized Optiminer fork that you can use to mine on the only available pool. Do note that before the hardfork hits all mined coins (solo or on the pool) will still be held for a 1 year term deposit in your wallet before becoming available. Recently there has been new somewhat positive development that may bring some miner back to mining HODL or at least trying to as the 1 year waiting time for the coins to be released is still there. Anyway, there is a new further optimized HODLminer forked by optiminer from Wolf’s code that does provide significant performance improvement (source). Below you can find a 64-bit Windows binary of the miner that you can use to mine HODL on your CPU, do note however that you still need to have a more recent AMD or Intel processor with AES-NI support in order to use the miner. You should also be able to use the slower non-AES-NI capable miner that you can find here for older CPUs without the required instruction support. Do note that you should be able to use this miner for other coins that rely on the HODL algorithm as there are apparently some already available such as ERC. The new miner however would be useless without a dedicated mining pool (it does not work with solo mining using the HODL wallet), so the same author also launched Optiminer HOdlcoin Mining Pool where you can point the miner to mine HODL for you. It is a PPLNS pool with 1.0% fee and requires 25 confirmations until a pending block counts as mined. Do note that all HODL coins are still locked for one year after mining as there is currently no way to withdraw the balance for miners. Instead, once the balance reaches at least 50 HODL, it gets eligible for including in a mining block. The next block will always be mined to the address of the miner which has the highest eligible balance at which point you would still have to wait for 1 year to actually be able to use these mined coins.